You will need to be out of your home during treatment, and you will have to remain out of the treated areas for (4) hours after the treatment or (6) hours if you have asthma or other health conditions. Dogs and cats can be locked in a bathroom or other room that will not be treated, but birds must be removed from the home during treatment. Fish tanks and aerators must be turned off and covered during treatment and remain covered for the 4 hour period after treatment is completed. Strip bed and wash and dry all sheets and any clothes exposed to bedbugs in HOT water. You can also place the above items in a high heat dryer cycle for at least 30 minutes or more to kill any bedbugs they may contain. Pull all items away from baseboards in any rooms that will require treatment. Empty closets, furniture, etc. Inspect the items. Place inside a plastic bag and remove from the room. Thoroughly vacuum floors and carpets. Vacuum bed, couches and upholstered chairs. Take the mattress and box spring off the frame of the bed and set aside in bedroom. Remove everything from under the bed (i.e., boxes, toys, shoes, purses and other items). Open sleeper sofa if applicable. Remove hanging pictures from wall and place in the room. Please remove the electrical socket and light switch wall plates, these areas should be dusted. Birds must be removed from premises and remain out for 4 hours after treatment. 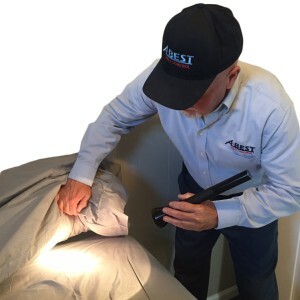 Thoroughly inspect room(s) for bed bugs. An insecticide will be applied to cracks and crevices, behind baseboards, and into other known or suspected harborage areas. Furniture, especially mattresses, box springs and bed frames, will be lightly sprayed with an approved insecticide. Inspect ALL used furniture and bedding before bringing it into your home. If you travel, check the bedding and room before you sleep there. If you have an infestation, moving to a new bed does not solve the problem. Wash sheets and blankets at least once per week. Put items in a high heat dryer cycle for at 30 minutes or more to kill bedbugs. Remove clutter – pick up clothes, boxes, toys, purses and other items where bed bugs can hide. Put your mattress and box spring in zippered, Bed Bug proof encasement.